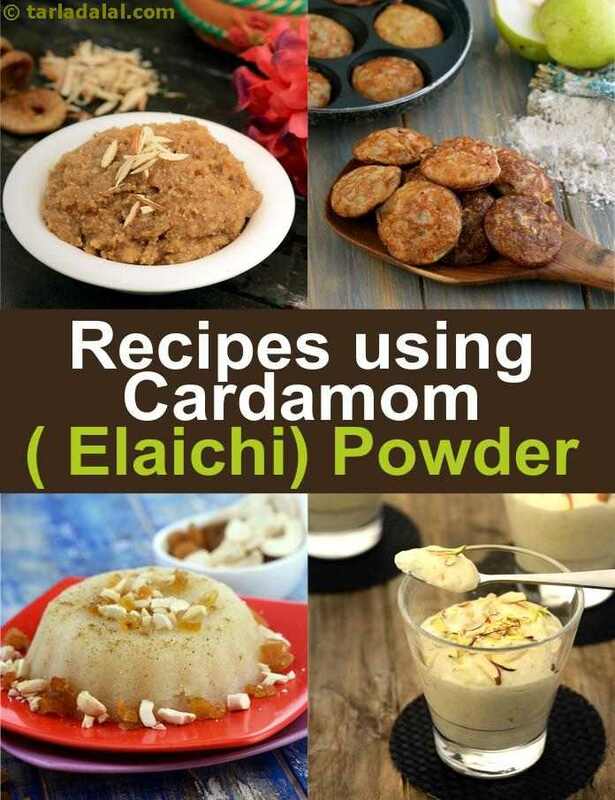 933 Cardamom Powder Recipes | Indian Elaichi Powder Recipes. Cardamom Powder Recipes. Indian Elaichi Powder Recipes. When whole cardamom is finely grinded we get cardamom powder. Because the taste of cardamom is so strong, you only need a pinch of it to flavor the food. The outside pod is not used to make the powder but can instead be used to infuse tea. Elaichi powder is widely used in Indian cuisine, mostly in sweet dishes and also in the middle-east to flavor beverages. We think that only whole cardamom pods are used to flavor savory Indian recipes but that isn’t true. The famous Dal Baati Churma has 3 elements one of which is churma. This is made with whole wheat flour, semolina and sugar and flavored with elaichi powder. This is then deep fried and served with hot dal. The combination of sweet and savory makes this dish wonderful. Another authentic recipe, Bikaneri Bhujia, is thick sev flavored with pepper and cardamom and deep fried to perfection! The most common use of cardamom powder would be to flavor desserts. In India almost all sweets have a hint of cardamom in them which makes them so rich in taste. It is added in sweets that are served at festivals like Malai Peda, Rice Kheer and Sheera. It is also added to the Indian version of ice-cream called Kulfi and its different varieties like Kesar Kulfi Falooda because of the unique taste it provides. It is a common tradition to have toast alongside a steaming cup of Elaichi Tea in the mornings. The toast usually served is Rusk. It is basically a bread that is baked twice to make it super crisp, tasty and aromatic. Since it is a little sweet in taste, the hint of cardamom tastes wonderful! A great way to cool off in the summer is by the way of summer drinks. Two delicious recipes that are perfect as coolers are Panha and Thai smoothie. They both have a hint of spices that give an innovative twist to them. Appams are tiny snacks that are made in southern India which are usually salty in taste. But you can make them unusual by making sweeter versions of it like Jowar and Pear Appam and adding elaichi powder to it for a unique taste. Look here for cardamom recipes. Try our other Indian Elaichi Powder Recipes. Scroll Down below for more!